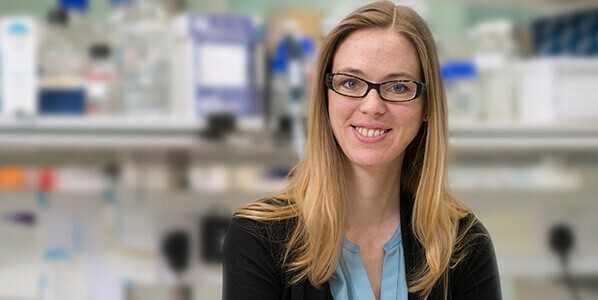 Dr Madeline Lancaster is a Group Leader in the Cell Biology Division of the Medical Research Council (MRC) Laboratory of Molecular Biology, part of the Cambridge Biomedical Campus in Cambridge, UK. She previously worked in the lab of Dr. Jürgen Knoblich, and has done groundbreaking work in the development of cerebral organoid technology that is leading to significant advancements in neurological development and disease research. Work in the Lancaster lab focuses on human brain development using cerebral organoids. The lab uses mini-brains to study the most fundamental differences between human brain development and that of other mammalian species. Dr. Madeline Lancaster received her PhD from the University of California, San Diego, while studying neurodevelopment in the lab of Dr. Joseph Gleeson. Her thesis work focused on examining signaling at the primary cilium and its implications in the human genetic disorder Joubert syndrome. During her time there, her interests crystallized around the development of the cortex, and she joined the lab of Dr. Jürgen Knoblich at the Austrian Academy of Sciences’ Institute of Molecular Biotechnology in Vienna, Austria. There, she studied cell fate decisions in the mammalian neocortex using an in vitro mouse and human neural rosette model system as a post-doctoral fellow. This is also where she followed through on an unexpected observation that she would later develop into three dimensional (3D) cerebral organoid structures, colloquially referred to as “mini-brains”. 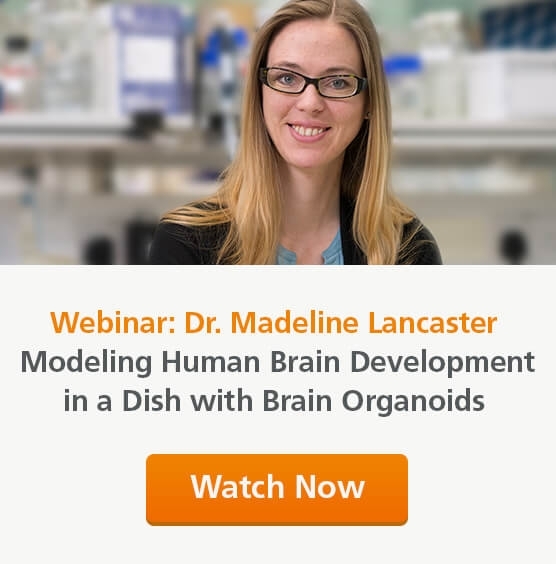 Now she leads her own research group at the MRC Laboratory of Molecular Biology in Cambridge, UK, where she is using her innovative 3D cerebral organoid model system to better understand brain development. How did you end up working in the organoids field? When I joined Dr. Jürgen Knoblich’s lab in Vienna, there was interesting work being done identifying genes in brain development of flies. But since there were so many genes identified, making knockout mice for every single one was not feasible. In order to make a more efficient screening system, I decided to start working with neural rosettes, which were quite new at the time. These two-dimensional (2D) systems have the self-organizing epithelial morphology of neural stem cells, similar to what takes place in vivo. I wanted to try using the neural rosettes to do a screen of these different genes in vitro, but coming out of the mouse field I didn’t have a lot of experience with in vitro culture at the time. This initially resulted in quite a few failures. One was that while working on developing neural rosettes, I had an issue with one of my dishes and couldn’t get the cells to stick. I noticed that they instead formed 3D floating balls which started developing. I ended up following up on these 3D floating cultures, and that’s basically where organoids started for me. So discovering these organoids was an accident? Essentially, yes. There were a lot of ‘luck’ factors that came into play and allowed the discovery to happen. First, we didn’t have any stem cells in the lab because nobody was doing any stem cell work. I initially had to work with isolated neuroepithelial cells from mouse embryos, which meant that they already had the identity that would later lead to their behavior of self-organizing into 3D structures. Had I started with actual stem cells, I probably never would have stumbled upon these observations. My lack of experience with in vitro culture was also something that helped in the end. The problem I had with one of my plates while trying to develop neural rosettes is ultimately what created the environment for these 3D floating ball structures to develop. The sequence of events was completely unplanned and unexpected. Only once we started following up on these initial observations did we really work to purposely optimize the method and apply it to human stem cells. Do you think that not having a background in stem cells played a role in the discovery? I was a bit of an outsider as a developmental biologist that had focused on mouse development in vivo - I had no experience with stem cells. After this work on cerebral organoids I started meeting people who had been working on stem cells for years. At one point I mentioned to someone that the discovery was an accident, and described how I had observed these weird balls of tissue forming. And he said, “Oh, I’ve seen those before when I was making rosettes and something was wrong with my culture plates.” I asked him what he had done with them and he said he had thrown them away because he didn’t want those - he wanted rosettes. So yes, it probably helped that I wasn’t so embedded in trying to make neural rosettes or culture stem cells the way that everybody else had been doing it. What made you decide to venture off track and explore your unexpected observations rather than dismissing them and staying on course? When we saw these really amazing self-organizing tissues, Jürgen and I both recognized that we had stumbled upon something quite interesting, and that we should look further into it. In terms of my approach to science, I always try to remind myself to be open to the idea that there might be something really unexpected around the corner, and that I should keep my eyes open for it. I think that many ‘pioneers’ whose discoveries have led to major leaps and advances don’t necessarily plan for that outcome. Ultimately, I think coming from outside the field and keeping an open mind is what made me follow up instead of tossing out my failed rosettes. How did these early observations grow into the 3D ‘mini-brain’ cerebral organoid model system we know today? After observing these 3D floating structures, I started playing around with Matrigel® and different media formulations. My focus turned to supporting the structures in terms of their tissue architecture and self-organization. Because we started with neuroepithelial cells, we didn’t need any growth factors to drive the cells’ identity. Even after we further developed the protocol to begin with stem cells as starting material, we still didn’t add any growth factors. This is what’s unique about our protocol; the cells are left to find their own path to becoming neuroepithelial cells. This is how I ended up with the organoid culture method we now use. Have you had any major backlash from the media or the public regarding the organoids? No, actually. We had a press conference when the paper was published and we could tell it would get media attention. We were nervous that members of the public might misunderstand the science. Instead, we were happy to find that the press described it in a very modest and realistic way, rather than overblowing it. Overall, I have been pleased with how well the media and the general public have handled it, and how well they’ve understood what we’re doing and why it’s important. With the new model system, we have been using the cerebral organoids to study basic questions of human brain development. We’re interested in this from the standpoint of evolution; in theory we could make a brain organoid from any species, which means we can do comparative studies with other species. We’re also interested in looking at candidate genes that are likely to play a role in human brain expansion, and at neurological conditions where brain size is abnormal. For example, in the original paper we did some work on microcephaly where the brain of affected individuals is too small. We found that cerebral organoids grown from induced pluripotent stem cells from individuals with microcephaly were smaller than the control organoids. The new system enables me to ask questions that I couldn’t ask before, and has opened a whole new world for me, and hopefully for others. How do you think cerebral organoids will impact the field of neuroscience research moving forward? With this in vitro system, we can look at our research questions in a whole new way. We were previously limited to a few accessible animal models, which is problematic when looking at more complex, human-specific processes in brain development, including human-specific disorders that can’t be modeled in mice very well; psychiatric disorders, schizophrenia, autism, and even neurodegenerative disorders. I’m hoping that this will open doors to a whole range of different studies that weren’t possible before. What are some of the limitations of this technology? The brain organoids we’ve developed are really great for looking at early developmental questions. They model quite well the kinds of neural stem cell fate decisions that are happening in the human brain. For example, the tissue architecture of the cortex is quite intact in organoids. But this is early in development, around the first trimester. As you get further along in development, the organoids start having issues with modeling later events, and this limits the application of our current technology to modeling very early brain development. Why is modeling later events in brain development particularly difficult? It’s likely the result of the technical limitations of being in vitro. The brain can develop on its own for quite a while without any external inputs, and there’s no vasculature for quite some time; it relies on diffusion from the external membranes and from the cerebrospinal fluid. Eventually during development, however, vascularization is needed. In order to develop functional neurons and create functional networks, sensory input and output are also needed. This level of development will be absent from a piece of tissue in a dish and is something that can’t be modeled at the moment. This is a much bigger hurdle than what we’ve overcome getting here. What we’ve done is relatively simple because we’re just relying on cells to do what they’re programmed to do. But to try to induce things like vascularization will require a much greater leap. How do you think we can overcome these types of challenges? For some of the big hurdles facing the field, I think it’s important for us to think outside the box, and sometimes this can mean entering the world of science fiction. For example, we published the first paper on cerebral organoids 3 years ago, and only 4 years ago it would have seemed crazy to think that we might be able to grow something that looks like a developing brain in a dish. Of course, now we know how remarkable pluripotent stem cells are, and about their ability to carry out their developmental programs in a completely intrinsic manner. So when it comes to big hurdles like figuring out vascularization, how to keep these tissues alive in the long term, or looking at neurodegenerative disease, we really need to think beyond what we know can be done; we need to consider what seems like science fiction, but what may one day actually be possible.